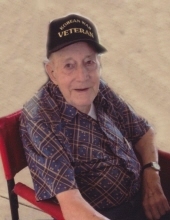 Edward J. Graddy, age 90, of Bourbon, Missouri, passed away Monday, January 28, 2019 at his home. Edward James was born on November 18, 1928 in Coffeyton, near Bourbon, Missouri, to the late Rufus Allen and Ruth Jane (Pratt) Graddy. He grew up and attended grade school at Forest Hill School and high school in Sullivan. Ed honorably served his Country as a Private First Class in the United States Army from 1950 – 1953, when he was honorably discharged. He was united in marriage to Kathy Reeves on March 7, 1953 in Bourbon, Missouri. They were blessed with 7 children: Sharon, James, Pamela, Rick, Cris, Keith, and Warren. Ed and Kathy shared 56 years of marriage together before her passing in 2009. Ed loved being outdoors and in the old days, he enjoyed cutting wood. He was also very active in his Church, the Leasburg First Assembly of God, where he served as Deacon, Church Secretary, Song Leader, Sunday School Teacher and Superintendent. Ed will be lovingly remembered by his family, church family and friends. Ed is survived by his children, James Graddy and wife, Donna, of St. James, MO, Pamela Chapman of Union, MO, Rick Graddy and wife, Toni, of Sullivan, MO, Cris Graddy of Cuba, MO, Keith Graddy and wife, Cheryl, of Cuba, MO, and Warren Graddy and wife, Donna, of Cuba, MO; 12 grandchildren; 17 great-grandchildren; 1 great-great grandchild; three brothers, Don Graddy of Geyserville, CA, Dean Graddy of Sullivan, MO, and Ronnie Graddy of Bourbon, MO; one sister, Hazel Pennock of Peoria, IL; nieces & nephews, other relatives and many friends. He was preceded in death by his wife, Kathy Graddy; one daughter, Sharon Graddy; his parents, Rufus and Ruth (Pratt) Graddy; nine brothers & sisters, Bill Graddy, Harold Graddy, Ben Graddy, Cecil Graddy, Dorothy Mae Whitaker, Mildred Hurst, Hilda Phillips, Evelyn Schmitt, and Betty Mayberry. Graveside services were conducted 12:00 PM, Friday, February 1, 2019 at Lea Cemetery in Leasburg, MO, with full military honors. Visitation was held from 10:00 AM to 12:00 PM, on Friday, at First Assembly of God Church in Leasburg, MO. To send flowers or a remembrance gift to the family of Edward J. Graddy, please visit our Tribute Store. "Email Address" would like to share the life celebration of Edward J. Graddy. Click on the "link" to go to share a favorite memory or leave a condolence message for the family.